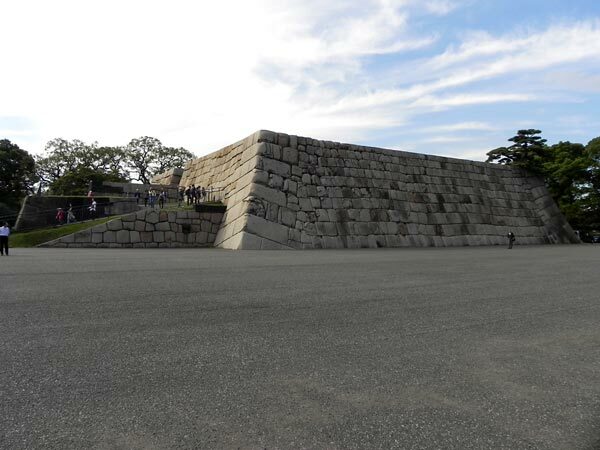 Tatsumi-yagura is the only preserved corner tower. Kikyo-mon is on its left side. The roof of Fujimi-yagura is seen through pine trees. Inhabitants of Tokyo are usually not conscious that they live in a castle town. There must be some reasons for that. One reason might be that the large part of the former Edo Castle estate is used as the Imperial Palace since the end of the Tokugawa Shogunate in 1867. 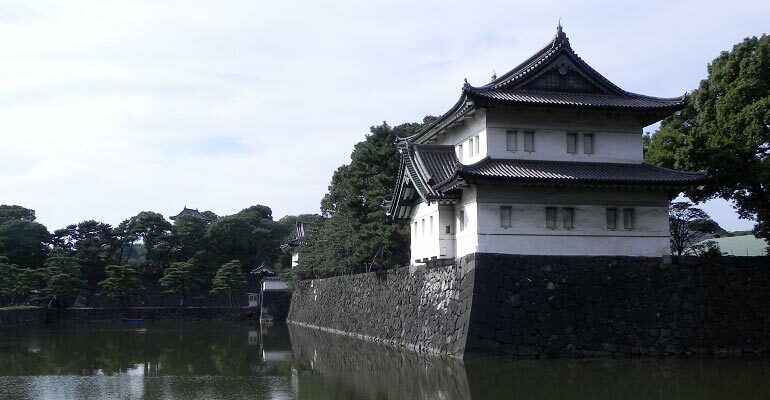 Therefore, the first idea when we think of the place is that it is the Imperial Palace. Numerous historical events, which occurred in the last hundred years or so, overshadowed the earlier history of the place as Shogun's castle. The absence of the image of the Shogun's castle is further strengthened by the fact that the most important buildings of the Edo Castle including donjon were lost since long. 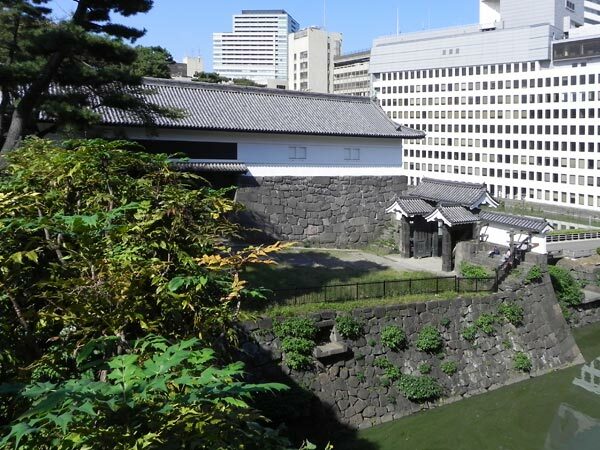 The area preserved as the former Edo Castle does not give a strong impression comparable to the well preserved castles such as Himeji Castle and Kumamoto Castle. 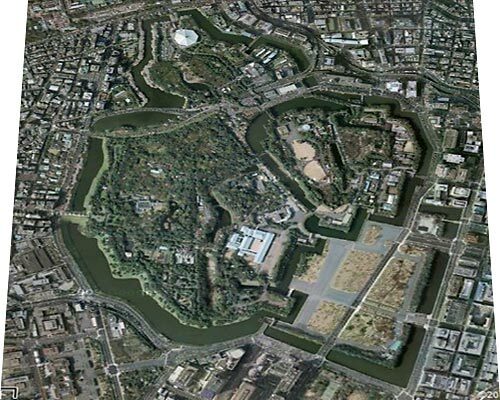 In addition, the huge size of the original Edo Castle, the diameter of whose outer moat is more than 5km, and the widely scattered fragments of old moats and ramparts make it difficult to visualize the original castle. 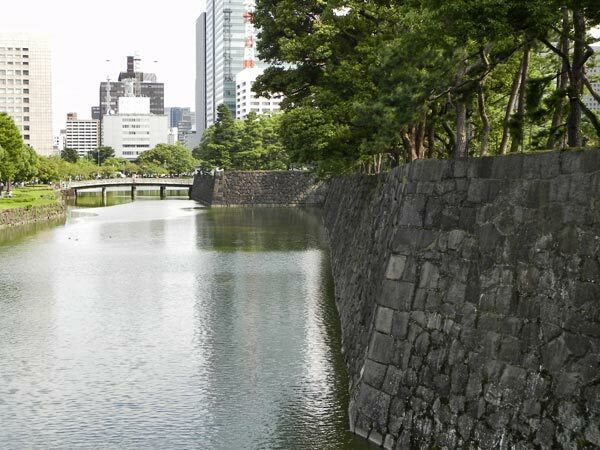 Nevertheless, we can often see moats and stone walls of the Edo Castle in our daily life. 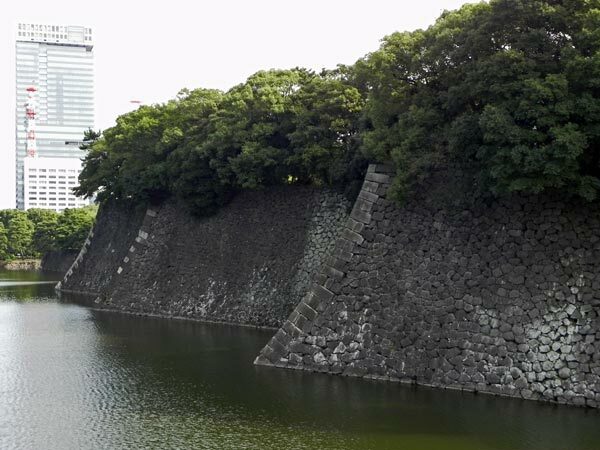 The Edo Castle had roughly speaking two sets of moats, the inner moat and the outer moat. While the outer moat is partly torn down and used now as highways and expressways, the large sections of the inner moat are still preserved in their original form. Nowadays, the pedestrian way along the inner moat has become a popular jogging course. 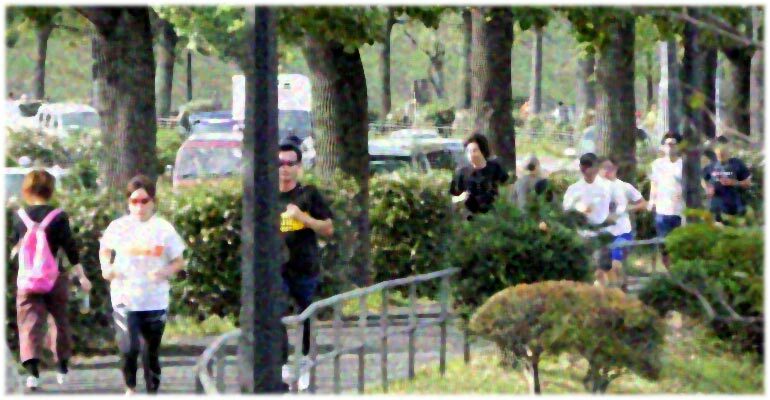 Especially during the lunch time break, the about 5km long route around the Imperial Palace is crowded with joggers coming from the adjacent offices. I took about three hours and walked along the inner moat to see the old constructions from the vicinity. 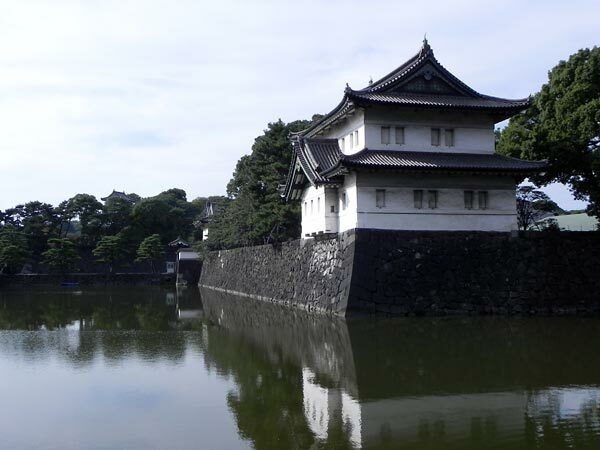 Here, I would like to show some pictures of the scenic places of the moat as well as in the East Park of the Imperial Palace. 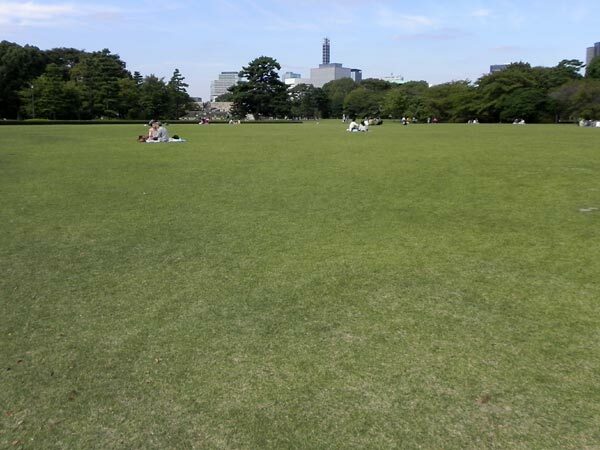 The East Park is the former main enclosure of the Edo Castle and is now open to public. This area is reserved for the Imperial Palace. Ordinary people are allowed to enter the more public part of it on special occasions. Chidori-ga-fuchi is a popular destination in the cherry blossom season. Tayasu-mon is the oldest one among the existing gates. Shimizumon well preserves the original enviroment. Kitatsumebashi-mon exists high on a large stone wall. Obiguruwa on the right side is a long strip of defence facility. The bridge in the center is a part of Hirakawamon. Behind Obiguruwa the steep and zigzag stone walls protect the main enclosure. 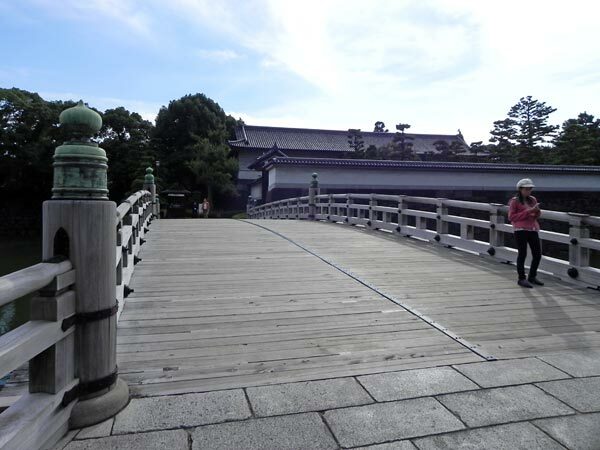 Hirakawa-mon keeps a original style wooden bridge. Oote-mon was once the main gate of the Edo Castle. One of the stations of guards. This space was once filled up with the main buildings of the castle. No impressive architecture has been saved from destruction. Donjon ought to be the symbol of power. However, the Edo Castle lacked donjon since 1657. Fujimi-yagura seen from its back side. The corner tower Tatsumi-yagura and Kikyo-mon on its left side. The roof of Fujimi-yagura is also seen through pine trees. 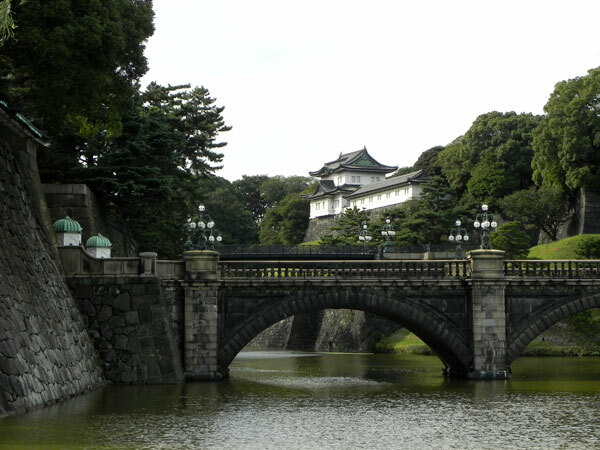 Nijubashi - the main entrance of the Imperial Palace. The tower behind the bridges is Fushimi-yagura. Sakurada-mon is now the most beautiful gate of the Edo Castle. 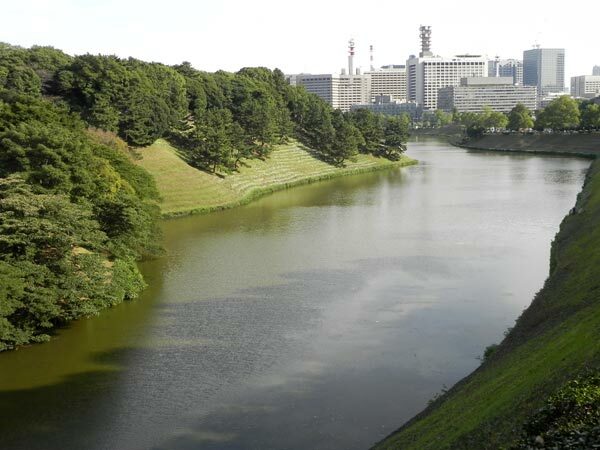 Sakurada moat seen from the vicinity of Hanzo-mon - the most dramatic scene around the Edo Castle. 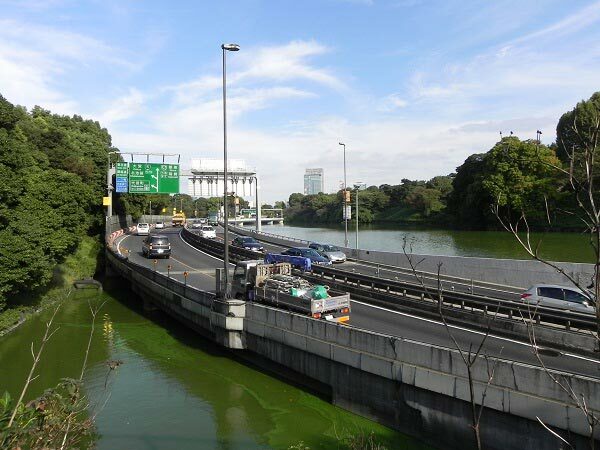 Expressway damages the landscape. Isn't it possible to restore the original quietness? 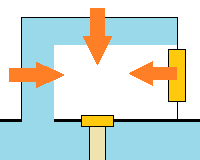 Tayasu-mon represents the basic idea. Invading enemies are enclosed with stone walls and a tight gate and attacked from three directions. 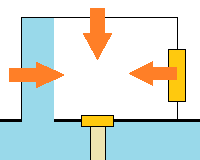 In case of Shimizu-mon, one side is moat. Two sides of Sakurada-mon are moat. 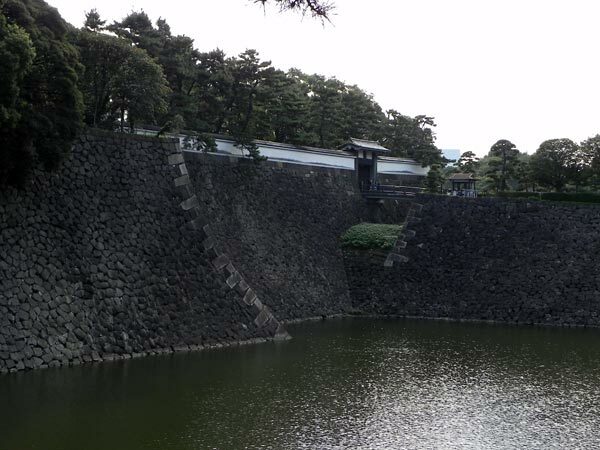 Chidori-ga-fuchi is the highest part of the inner moat. Chidori-ga-fuchi is famous for its beautiful cherry blossoms and is the only place in the inner moat where people may row boats. The level difference to the lowest part of the inner moat is about 15m. The gate between Chidori-ga-fuchi and Ushi-ga-kubo is Tayasu-mon ("Mon" means "gate". ), built in 1636 and the oldest existing gate, as it is the only one gate which could survive the great fire in 1657. Ushi-ga-kubo is much lower than Chidori-ga-fuchi and filled with water plants. At its lower end exists Shimizu-mon. Shimizu-mon was rebuilt in 1658 after the devastating fire, but its stone steps well preserve the original style, namely the level difference between steps is huge so that eventual invaders cannot smoothly go up the slope and become easy targets of defending snipers. 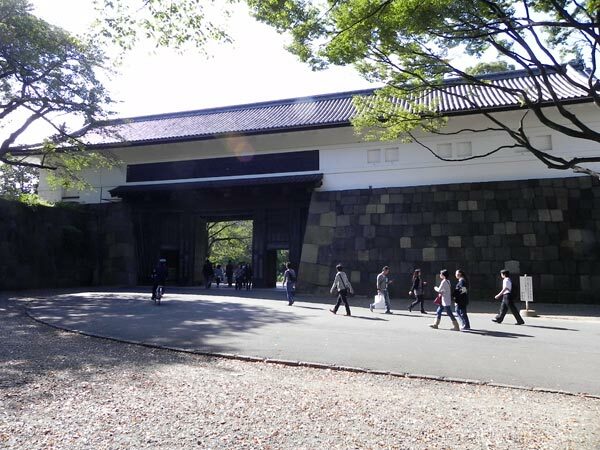 Generally speaking all gates of the Edo Castle have a set of the front and somewhat slightly built gate, the closed square space and the massive rear gate. 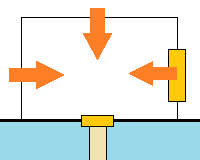 When enemy break the first gate, they are stopped in the closed square space and become the target of defending soldiers who shoot from the massive gate, on top of the stone walls or on the other side of the moat in case one or two sides of the space are surrounded by moat. 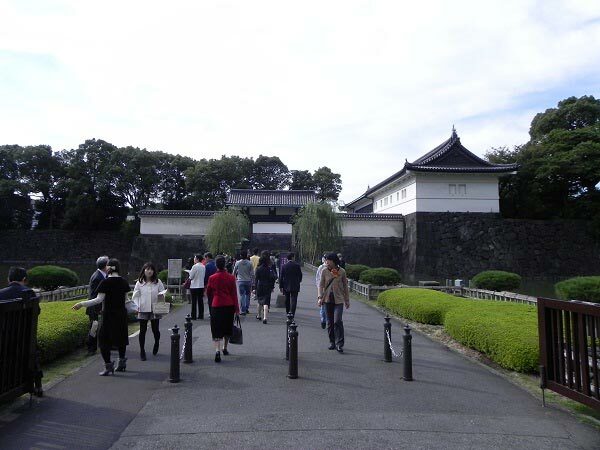 The massive rear gate is built in principle on the right side of the front gate, because most solders are right handers and it is difficult for them to smoothly react to the attack from right using their bows or muskets. Kitatsumebashi-mon leads directly to the main enclosure of the castle and therefore uses a drawbridge. In order to defend the most fragile part of the castle, the dual rampart system was constructed between Kitatsumebashi-mon and Hirakawa-mon. Obiguruwa is now covered with pine trees, but it was originally equipped with defense facilities. Hirakawa-mon has a special plan, because it is located at a weak point of the castle. The outer gate does not face the moat squarely to evade eventual attacks from the other side of the moat. The gate comprises of one massive gate and two gates, one of which is the entrance to the intermediate defense facility Obiguruwa. Hirakawa-mon used to be used for transport of dead persons and criminals. It was also used by ladies in waiting. Oote-mon was the main and most formal gate of the Edo Castle. The present building was rebuilt after the destruction in WWII. Entering the Oote-mon, we can pass by the buildings of the guard and reach a spacious area where the main buildings of the Edo Castle once stood. No spectacular things remain except for the foundation of the donjon. 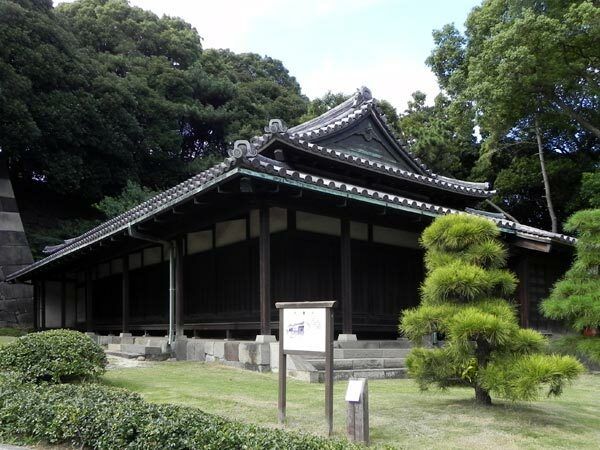 The foundation was constructed after the great fire in 1657, however never used, because the Shogunate gave up rebuilding an unnecessary lavish building. The austerity policy was already needed in the mid of the 17th century. 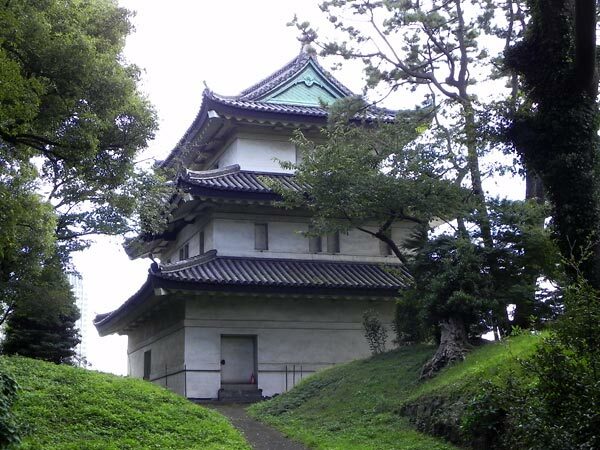 A three-story tower Fujimi-Yagura was used since then as donjon-substitute. It looks beautiful and impressive from the other side, but unfortunately that side is open to public only on special occasions such as Emperor's birthday. 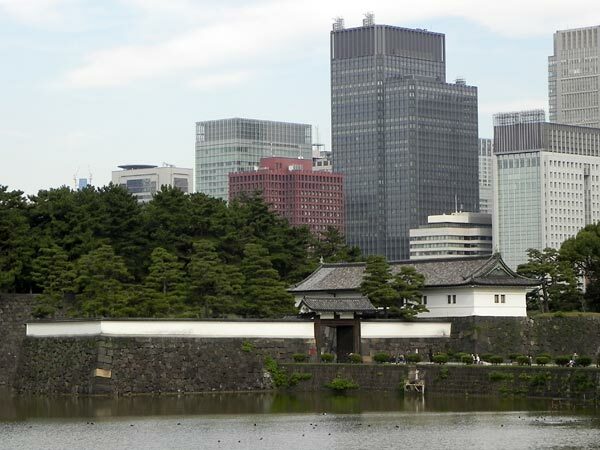 There must have been many corner towers for the Edo Castle. However, this Tatsumi-Yagura is the only remaining among them. 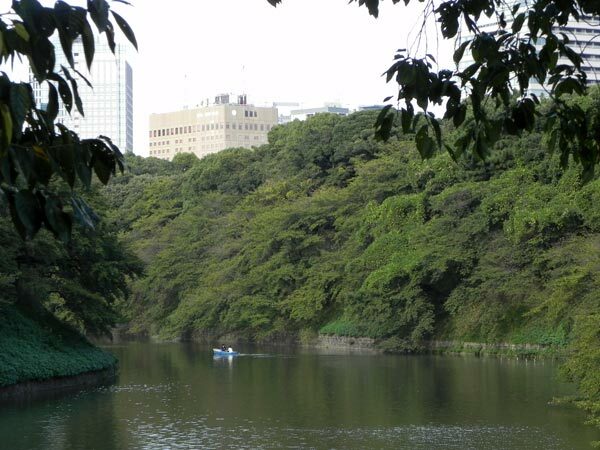 From the Kikyo-mon, which is usually closed to the public, we can see the wide and flat view of the Outer Garden of the Imperial Palace. Nijubashi is the formal gate for the Imperial Palace. "Niju" means "dual" in Japanese and many Japanese people do now know why this name is used for this place; whether because two bridges overlap each other? The right answer is that the rear bridge had earlier two story structures as it was spanned high above the moat. Sakurada-mon is famous for the "incident at the Sakurada-mon" in which the Chief Minister Ii Naosuke was assassinated in 1860 by samurais with radical exclusive idea, because Ii decided to conclude the Treaty for Amity and Friendship with the US without the permission of the Emperor. However, only a few years later, in face of the overwhelming military strength of the Western countries, the influential leader changed the policy to open the country. Sakurada-mon is surrounded by water and presumably the most beautiful gate of the Edo Castle, I believe. From the gate we can see over the moat the building of the Dai-ichi Life Insurance Company, which was the headquarters of the occupation army between 1945 and 1952. When we walk along the inner moat clockwise from the Sakurada-mon, we see the both sides of the moat covered with greens. The moat follows the course of a natural river and has a wide width. This area is a sort of back side of the castle and there is only one gate, Hanzo-mon. Hanzo-bori and Chidori-ga-fuchi was not separated before a causeway was made and a street was constructed in the Meiji period (1867-1912). Since 1964 a motorway exists on the surface of Chidori-ga-fuchi and disturbs the otherwise quiet and peaceful environment.